Is the 7th still as dreary as I recall? The 7th dreary? Quite the opposite--it's a violent, angry piece, Henze's most Beethovenian work and I think the pick of the symphonies (the far more light-hearted 8th wouldn't be too far behind in my mind, though). I could see thinking of the 9th as dreary, though; the male-only chorus tends to leave the music monochromatic and, though there are a few fine moments, I think it's rather dull and worthy overall. FWIW, I have a strong preference for the Wergo recording of the 7th: Janowski's faster tempi keep the tension level much higher than Rattle's EMI recording. To be fair to Rattle, his was a recording made soon after the work was premiered, and the CBSO probably didn't have as much experience with late Henze as the RSO Berlin would have had by the time Janowski made his; also Rattle's recording comes with the otherwise unavailable Barcarola, which I've not heard in a while but was well worth the time. Henze's Barcarola was recently performed at the Proms by Oliver Knussen and the BBC SO. I found the performance much more detailed and convincing than the Rattle, which by my estimation is an older recording. No doubt Knussen has had more time with the work than Rattle did at the time he recorded it, so perhaps an unfair advantage. It introduced a program with neoclassical and serial Stravinsky and Tippett's 2nd symphony, to great effect. Will listen again to the recording soon. Never bought from Amazon.de before, so I don't know of their reliability, but it was worth a shot. Anybody have any good experiences with Amazon.de? As Edward points out, the 7th is hardly a dreary work at all. It's one of the most thrilling works of the last half of the 20th Century. I don't really know how you could come away feeling that way after listening to this work. I'm surprised to see DG not put more advertising into their Henze set...oh wait...this is Henze we're talking about and not Beethoven. I forgot. To the experienced Henze listeners here, how would you describe his compositional style to those of us out there that are newcomers to his music? I would categorize Henze as an expressionistic composer. His music has violent, dissonant outbursts interspersed with strenuously lyrical moments. Sounds like my kind of composer then! I read somewhere he is the heir to Hartmann, do you agree with this, Kyle? I have never heard that statement before, but I certainly agree with it! Henze is more difficult and eclectic than Hartmann, but both of their music is determinedly serious and almost relentlessly aggressive, but not without lyricism and moments of great visionary power. I especially admire him as a composer because while he is unafraid to experiment, he never cuts his ties to the musical traditions of the past. Henze's symphonies are definitely in the line of great German symphonies from Beethoven to Mahler to Hartmann. 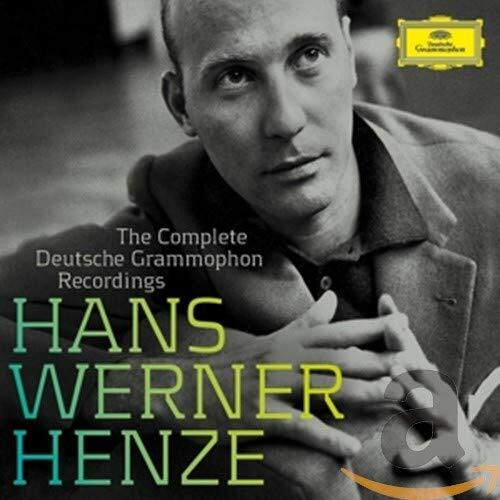 You'll really like Henze's music, I think! Just don't expect his music to be the same difficulty level of Berg or Hartmann. I don't really view Henze's music as being 'difficult' or any music as being such. I either respond to it or I simply do not. There are some works that will always require more listening to fully appreciate and then there are some that I'll probably never come around to, but I continue to persevere. But, let's just say, if I were to continue to view Schnittke as a 'difficult' composer like I did in the past, I would have never come around to appreciating him. There's a time when you have put your guard down and just listen to the music for what it is. You'll either 1. like it or 2. not like it. For me, time has proven to be a great healer and the more experience I get under my belt, the more I am able to come to a composer like Henze and listen with a clearer mindset than I had before. 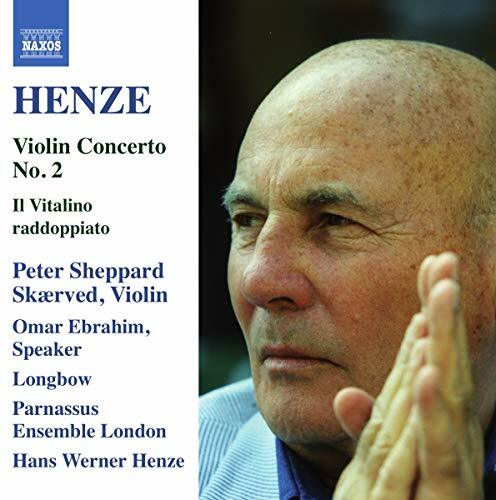 As for the Hartmann-Henze connection, I can definitely see and understand the lineage, but, to my ears, it seems like Henze has more or a 'French' sounding orchestral approach except for the heavy sections like in Symphony No. 7 when this is some good, old-fashioned German angst, but in some of the more lyrical moments I hear a lot of clarity and not much heaviness that you would otherwise hear in German music. I think Henze is quite hard to pin down, as he's rather stylistically eclectic. A work like Voices shows a composer sampling all sorts of styles and trying to tie them together (not always successfully); Essay on Pigs obviously finds parallels in contemporary works by Maxwell Davies (most obviously Eight Songs for a Mad King); yet one also finds a Beethovenian work like the 7th symphony and an almost Mendelssohnian lightness in the 8th. Hartmann's influence is certainly present, and Henze often cited Mahler and Ravel as other key influences, but I think the composer he took most from was Berg. I hear a lot of Wozzeck and even more of Lulu, particularly in the vocal and operatic work--Die Bassariden is blatantly derivative of Berg's operas (but in a good way). But the instrumental music often has more in common with the complexity and hidden Romanticism of the Chamber Concerto (for example the Second Piano Concerto or the Piano Quintet, where an austere facade intentionally fails to entirely conceal the emotion below). Okay, so Berg seems to be most the common thread with Hartmann and Henze. Excellent! As Berg is one of my favorites. All of the other things you wrote sound equally enticing and I'm getting more and more excited to hear his music blasting through the stereo. I'm definitely going to crank up Symphony No. 7 when I receive it. I'm glad I finally am exploring this composer, but I had to hear Hartmann first and I absolutely love his music like I did Berg's before him. I'm thinking there are many set of 20th Century Symphonies like this: Searle & Frankel, to name but two obvious ones. Old post I know, but have to say that Searle and Frankel were 12-tone composers whereas Henze worked in a completely free style as pointed out so informatively by Edward. Yea, that's sweeeet! Yea, .de was good to me. Good to hear, snyprrr. Excited to receive the Henze set! I wonder whatever happened to Knussen's unreleased DG recordings of Heliogabalus Imperator and the 8th symphony from about ten years back. If they're half as good as this one, they'd have been well worth hearing. I'm very happy with Naxos's latest Henze release, and have been listening to it a lot. Peter Sheppard Skaerved went to Kickstarter to fund the first commercial recording of Il Vitalino radoppiato (though I'm informed Austrian Radio have a performance with Gidon Kremer in their vaults). It's a big success in my book; one of Henze's most appealing scores, a chaconne on a chaconne (Tomaso Vitali's once-famous one, henze the title) that travels through various styles, from Baroque pastiche, to high Romantic pastiche, to Henze pastiching himself in the final cadenza. I wasn't overly impressed by the First and Third violin concertos in the previous Naxos release in this series, but the Second is a different kettle of fish. It's Henze at his most radically postmodern; the soloist dressed as Baron Munchausen, a tape part (simplified and made more focused for this recording), and a bass-baritone singing a commentary on Godel's theorem. Sounds very '60s, but sometimes this sort of mix just works, and I think it does here, in an archive BBC recording conducted by the composer. The couplings look a little slight, but I think they're all previously unreleased on CD. I'll be interested to see how Stenz compares to Janowski in the symphony. A recording I'm crossing my fingers for - will it ever materialise? - is Henze's Phaedra, which made an enormous impression on me here in Berlin: I went to see it twice (very unusual for me). But...the counter-tenor was awful, hooty and screechy, and I never ever want to hear him again. The opera has a rather obscure action, and the music, fitting the original meaning of obscure, is richly suggestive with a dark undertow - and amazing orchestration, so I gave up trying to understand what was happening and listened. I saw The Bassarids (Die Bassariden) many years ago, and was similarly affected, but Phaedra revealed a deeper aural magic to my ears. In general I agree with an earlier post that Henze's forte is theatrical (and vocal?) music - but would add cinematic to that epithet. Some of his music for film is transporting - you don't need to see the film; or, to put it in another way, the film is almost superfluous. Years ago I downloaded LP rips of Swann in Love (a decent but not overwhelming film), Resnais' Amour à mort - both music and film quite mysterious and unsettling - and Muriel, very disturbing indeed, and that film is one of the great masterpieces of cinematic art. Unfortunately, only the music for Katharina Blum and Swann in Love is still available on the Avant Garde Project website (an immense resource, even if some recordings have been deleted on account of CD availability). I am tempted to put Henze right at the top of the list of great film composers, just above Bernard Herrmann.